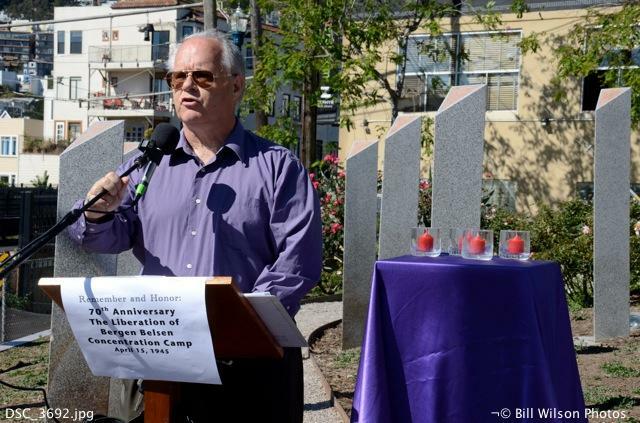 My cousin, Bill Wilson, at a ceremony he organized in San Francisco honoring the 70th anniversary of the liberation of Bergen Belsen Concentration Camp in Germany. While most of us were thinking of taxes on April 15, 2015, my cousin Bill Wilson​ was speaking at a ceremony remembering the liberation of Bergen-Belsen Concentration Camp in Germany that had taken place 70 years earlier. At the San Francisco ceremony, Bill spoke about the role his uncle (my father) played in that sad episode of world history. 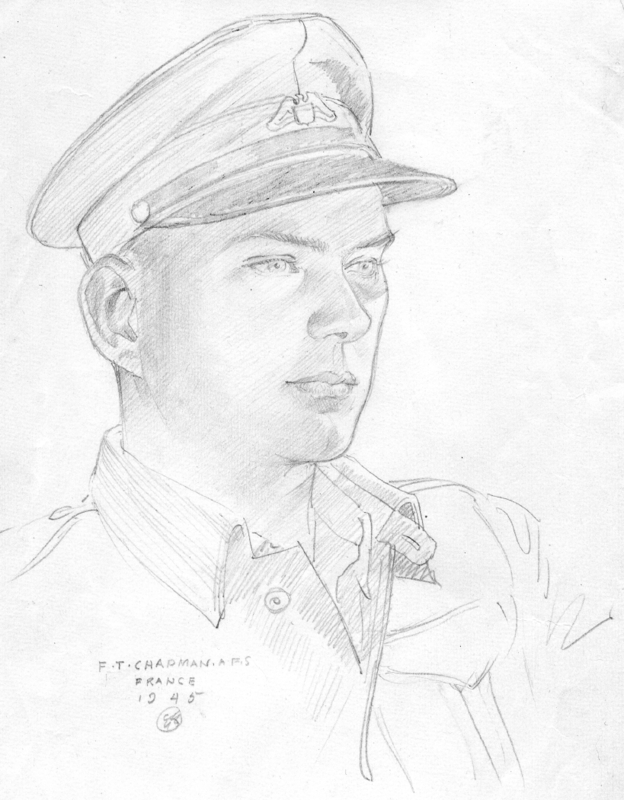 Bill is working on a compilation of letters my Dad, Conrad Wilson, wrote, including a few rare recollections he wrote about his role as an ambulance driver with the American Field Service searching for survivors when the British Army, with whom he was serving, liberated the camp. This was a part of Conrad’s life that he suppressed for decades after the War, rarely if ever speaking of it. That silence changed, briefly at least, in 1969, when Bill wrote to Dad asking about his role in searching for survivors in the Camp—something that Bill’s father, Dave, had mentioned on occasion but said that his brother never talked about it. I’ve pasted at the end of this blog the letter from February 16, 1969 that Dad wrote to Bill—a letter that I’ve read from time to time, but always with difficulty. A sketch of my dad in 1945 by a fellow American Field Service volunteer, F.T. Chapman. By way of background, Dad, who died in 2005, was a lifelong Quaker pacifist. He was a Conscientious Objector (CO) in World War II, choosing on religious grounds, not to join the war effort. COs were largely ostracized by society given the general fervor for war, but most COs were willing to serve their country on projects of national importance, albeit not in direct conflict, and the Civilian Public Service program was created for these people, including my Dad. Civilian Public Service work was often difficult and unpleasant. Following a stint draining virgin cypress swamps in Maryland, Dad was stationed at the Connecticut State Mental Hospital where he cared for patients (inmates?) who, in the pre-medication era of mental illness treatment, were often kept restrained by straps under horrible conditions. Seeking release from that emotionally draining work, Dad petitioned the Civilian Public Service Board to be released early if he joined the American Field Service—an ambulance corps that served during World War I and II. The Board agreed, and Dad shipped off to Europe to drive an ambulance with the British Army. At a certain point in the campaign to push the Nazi’s north through Italy, Dad and a number of other AFS volunteers were diverted to a different campaign: the liberation of Bergen Belsen Concentration Camp in the Lower Saxony Region of northern Germany. I was with some pretty tough guys – tough in the sense of experience with horror. We had worked at the front lines in Italy, evacuating the wounded, driving all night without lights on dark bomb pitted roads, sometimes, with an urgency to the hospital tempered with knowing what pain each bump caused the wounded soldier. We were a mixture of freaks, daredevils, religious fanatics, etc. hard drinking (straight gin before breakfast! ), good and bad. But most of us had been through difficult campaigns and were some what hardened to suffering. My first impression of Belsen was of these same Americans, on first sight of the misery there vomiting, crying, cursing or praying. I saw strong men down on their knees asking for forgiveness for being people I suppose. But it was much worse than anything we had ever seen, read about or imagined. You know propaganda was rather strong in war time, and liberal-minded people were inclined to disbelieve what the newspapers said about the atrocities. I especially. The prisoners I met at times seemed just like the rest of us, harmless enough. Just people. So we were unprepared for Belsen. Our job was to evacuate the barracks where the prisoners were housed. At that time I was not driving an ambulance but acting as a spare driver. So I was assigned to the job of going into a hut, preparing the people for evacuation, and loading the ambulance. The driver then took them to the “human laundry” where they were shaved, scrubbed, fumigated, sprayed, and if they survived that, evacuated to a tent hospital outside he concentration camp. Belsen was peculiar in that there was no slaughter of Jews, no gas chambers, but a general level of health that was worse than all other camps. In all fairness to the Germans, I believe, and was told that this was caused by events of the war – the cutting off of rail lines and supplies towards the end of the war, and that a general starvation and epidemic of disease resulted. Be that as it may, the result was that everyone was either dead or close to dead of starvation and typhus or other illnesses. I would go to the hut on the list – a long low frame building like our CCC barracks on the 1930’s – and find it absolutely jammed with people, dead and dying, the living on top of the dead, not even able to know what was happening. Some would resist, not knowing if they were being taken out to be killed. I had to choose whether to take this one or that, taking the strongest first in hope that they might still live, sometimes leaving till last those who seemed dead or not likely to survive. I t seems to me after all these years after, that they were like sardines in a can, the bottom layer dead the top just crawling around over the dead, and sometimes you had to dig through the dead because you saw an arm moving through the bodies that indicated that someone was alive underneath. Is it just a dream? I don’t think so, because I remember thinking at the time that it could never be really exaggerated, no words could really describe the horror of it. You see, we had arrived too late for most. There were thousands of unburied dead…I can remember that with bulldozers the army dug great long and deep trenches, perhaps twenty feet deep, fifteen feet wide and long as our house, they seemed. And into these the bodies were placed in rows and layers. A layer of bodies, quick lime, some dirt and then another layer of bodies, and so on up to the top. I know one was filled and another was dug. And I saw the former guards, not Germans but Hungarians, Polish etc. who were also prisoners who cooperated with the higher ups and thus got special privileges, assigned now by the British to work day and night burying the dead, 24 hours around the clock ay after day until they fell exhausted and were pushed into the pit and covered up alive (by our side). It took us about a month to clear the camp, as I remember. Then when it was empty, it was burned to the ground. I spent some time later with German friends I had met at Bassum near Bremen. I tried to tell them about the experience, but they couldn’t really comprehend that such events took place in their beloved country. And these were really nice people, just like our families, perhaps even better educated than our Wilsons. How could it have happened? Were they also to blame? I guess we were just about as much to blame. And are today to blame for those things that happen here that we don’t want to know about. We can all be really ignorant of things we don’t want to know. Copyright Alex Wilson. All Rights Reserved.